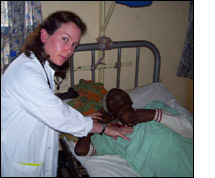 I was assigned to work as an attending on the women's ward for my month at the Mbingo Baptist Hospital in Mbingo, in the Northwest Provence of Cameroon. The ward consisted of 28 beds all in a single room, though. Two residents covered each ward, or in my case a resident and a nurse practitioner. On arrival to the ward, I was first struck by the number of people waiting just outside the ward's door, and quickly learned that each patient was required to bring a care-giver while hospitalized to prepare meals, do laundry, and provide basic care. These care-givers had nothing to do during their down time, and could often be seen napping on the lawn or playing cards. Patient's illnesses ranged from common diagnoses we would see in the US, such as CHF exacerbations and diabetes management, to tropical diseases such as filaria and typhoid, to complications of diseases that we rarely see in the US anymore, such as 40-year-old women with metastatic breast cancer. We also had an astonishing number of patients who were suffering from complications of end stage AIDS. At one point, our ward had about a 90% rate of HIV infection, and we diagnosed multiple new cases each week. Because of the extreme poverty in Cameroon, another problem we frequently encountered was inability to pay for medical care. To be hospitalized, patients were required to make a down payment equivalent to about $60, though people could commonly make just a portion of this payment if unable to pay the full amount. Each portion of the hospitalization was billed separately. For example, having a fine needle aspiration of a mass was $20, an LP was around $6, one tablet of acetaminophen was 3 cents, etc. Very sadly, we had a number of patients who left prior to completion of their medical care for financial reasons. It is easy to dwell on the sadness and poverty I encountered, but it is important to point out that during my month at MBH there were a number of positive outcomes, with patients leaving the hospital in better condition than they entered. In all, my trip was an amazing learning experience. My time in Cameroon put many of my daily experiences in the US into perspective, and gave me the opportunity to form connections with Cameroonian practitioners that I hope to maintain and build on over the long run. Thank you so much for helping to fund my trip, which was certainly a life-changing experience.